Whether you drink it for its stimulating effect, its unique flavor, or its antioxidant-rich nature, coffee is a popular and enjoyable beverage. While its preparation has remained standard over time, coffee machines have improved the quality of the coffee people enjoy. With their premium electrical systems, for instance, cooking speed has improved significantly. Their spacious designs cook copious amounts of coffee per session, while their feature-rich systems diversify the coffee-preparation option of users. The 10 products we have reviewed in this article are among the best. Replace your traditional kettle with one to enjoy professional-grade results at home. Coffee is a delicious and nutrient-rich elixir that soothes the body and mind. Unfortunately, because of poor cooking technique, many individuals often compromise flavors and the quality of coffee produces overall, with poor results. To overcome this challenge, Bonavita BV1900TS is an ideal coffee maker to use. Durable, cost-effective, and made of BPA-free stainless steel its performance is professional-grade. Coffee preparation is fast and efficient, while its large 8-cup carafe prepares enough coffee for individuals with a small family. Bonavita BV1900TS has a precise and powerful heating element (1500-watts) with an adjustable temperature (195-205 degrees Fahrenheit) system. It also has a convenient one-touch system (with auto shutoff), a filter basket that extracts coffee uniformly, and a pre-infusion mode that degasses coffee before brewing. Certified safe and convenient for use at home, Black & Decker DLX1050B delivers quality brewing results in an affordable package. Fully programmable, this 12-cup machine is fun to use. Output is copious and professional-grade, while it stylish black body has a stain-resistant glass carafe that maximizes the quality of the coffee it prepares. Unlike plastic models that impair flavors, for instance, your coffee will be smooth and palatable devoid of the recipe you are using. 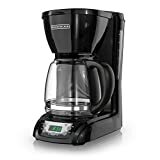 Black & Decker DLX1050B has a water-level indicator, a programmable timer/clock for customizing brewing, and effective safety features including auto shutoff. Perfect for light duty brewing of various coffee types, Mr. Coffee TF4 appeals to students and bachelors. While it is not as large as Black & Decker DLX1050B and Bonavita BV1900TS, its performance is unmatched. Its unique brew and serve technology, for instance, enables you to serve coffee at any time, even when it is still brewing. Finally, courtesy of its removable filter basket, the four cups of coffee it cooks are smooth and palatable. Apart from its performance, Mr. Coffee TF4 is popular in top 10 best coffee machine for is ease of maintenance. Its stain-proof warming plate, aesthetic outlook, and cordless operation are other major attractants. Apart from its premium power tools, Black & Decker has made coffee preparation a breeze with its coffee makers. This 5-cup DCM600B model, for instance, is an exceptional model (in black) with a compact design that does not clutter space. It is affordable. It is also easy to use and has premium parts and technologies that better the experience of users further. For instance, for a few dollars, you get a stain-proof glass carafe (Duralife) with clear marking for measuring water. Its 1-4 cup removable filter basket is easy to clean, while its optimized brewing temperature guarantees optimal extraction of coffee grounds. For optimal brewing results whenever you are preparing coffee, Mr. Coffee PSTX91 is an ideal coffeemaker system to use. Electricity powered, it heats up faster (up to 20%) and hotter (up to 205 degrees Fahrenheit) for better coffee extraction. The removable water reservoir offered is large and easy-to-fill, while its novel fresh brew system offers quality devoid of your recipe. Finally, for better tasting coffee, this 10 cup coffee maker has integrated a novel water filtration system into this coffee maker. Apart from filtering solids, it also removes chemicals such as chlorine (up to 97%) from water to keep coffee pure. 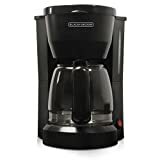 A popular full pot and single serve coffee maker for personal use, Hamilton Beach 49983A FlexBrew never disappoints. Because of its flexibility, for instance, coffee making is a fast and easy process that appeals to most individuals. Coffee extraction is also optimal, while its compatibility with both ground coffee and single serve packs has bettered its reputation further. 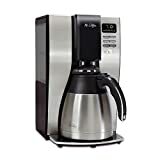 Instead of buying wasting money on a stovetop kettle, buy Hamilton Beach 49983A FlexBrew today to prepare up to 12 cups of delicious coffee effortlessly on demand. It is easy to use, affordable, and backed by a 1-year warranty. With a programmable brew stations such as Hamilton Beach 48464, you can now cook up to 12 cups of delicious coffee at home. Unlike traditional coffee makers that use carafes, it has a premium design that supports one-hand dispensing. Its versatile system, on the other hand, extracts most grounds for better-tasting coffee and has a customizable (0-4 hours) shut-off feature or safety. Unlike traditional or manual models that often burn coffee, therefore, you will have a positive brewing experience with an original. Hamilton Beach 48464 is space efficient and has versatile brewing options including bold and regular. As most Mr. Coffee makers, this five-cup DRX5 edition is a fully programmable model that retails cheap. If you have a tight budget, therefore, but want to enjoy quality coffee on demand, it is a perfect product to consider. Considering its size, its output (up to 20 ounces) is admirable. Setup and operation are straightforward, while its advanced features work in synergy to improve quality. When cooking, for instance, its bright indicator lights tell users when it is on and ready to use. Its removable filter basket is easy to clean, while its large water reservoir and brew pause system better the experience of users. 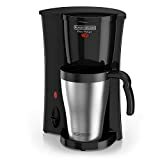 BLACK+DECKER DCM18S is a versatile brew ��n go coffee maker that works well indoors and outdoors. Whether you are looking for a space-efficient coffee maker for use at home or in a camping site, this model works well. Because it brews directly into 15-ounce mugs, you do not have to cook coffee in bulk, as some larger brands often require. Its design is light and portable. The permanent filter it uses eliminates the need for messy disposable ones, while its durable stainless steel body lasts long. In transit or storage, it does not dent nor scratch easily. Its charming black themed also resists fading and its electrical system certified safe for home use. In top 10 best coffee machine, Cuisinart DCC-3200 is a popular coffee maker with a programmable Perfect Temp system. Even though simple, coffee production is unmatched. For instance, because its electrical element burns hotter, it extracts grounds better to produce flavorful coffee. Its keep warm feature (adjustable) keeps coffee fresh and hot, while its desirable 12-cup capacity benefits people with large families. Other admirable strengths are its effective gold-toned filter (permanent), 24-hour programmability, and brew strength control system.